Outfitter Satellite offers Inmarsat BGAN terminals for land portable and land vehicle applications. This equipment offers highly reliable broadband internet access up to 492 kbps as well as voice, ISDN, SMS messaging, and HDR Streaming IP data (depending on the BGAN equipment model selected). 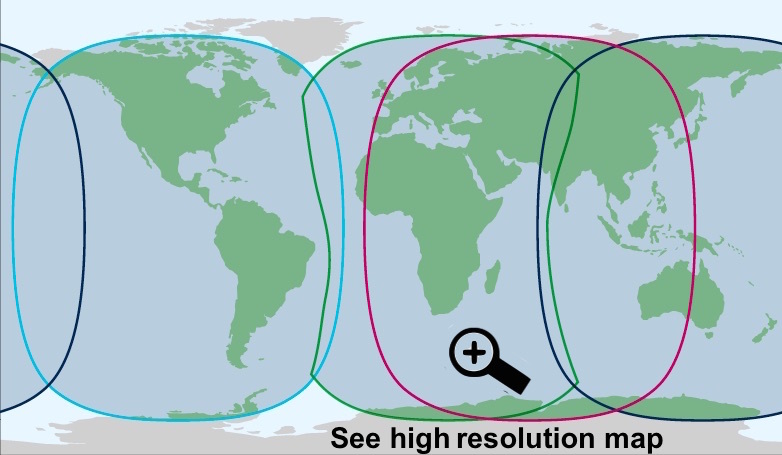 One reason for the high reliability of Inmarsat The geostationary satellites used by Inmarsat provide nearly global coverage, excluding the polar regions (see coverage map). Workhorse BGAN Terminals: Outfitter Satellite rents and sells the EXPLORER 510 by Cobham which is a Class 2 Inmarsat BGAN terminal. This class of BGAN is the right choice for most individual users needing basic email and web connectivity. Class 2 terminals have the best overall combination of functionality, small size, and low cost. Though the EXPLORER 510 weighs only 3.1 lb, it offers internet access speeds up to 464 kbps. Laptops, tablets, and smart phones can connect via 802.11 b/g/n Wi-Fi. The BGAN can be controlled from an easy-to-use web interface. Our kit includes a USB-to-Ethernet adapter for users that want a conventional wired connection. Phone calls can be made by iOS and Android smart phones using a free app. Highest-Performance BGAN Terminals for Realtime Video Applications: The EXPLORER 710 by Cobham is a class 1 Inmarsat BGAN. It is a favorite of government and media users because it offers the fastest standard IP data and streaming IP data speeds available over the Inmarsat network. Standard IP data speeds reach up to 492 kbps. HDR or high data rate service offers a 580 kbps minimum assurance and can reach up to 800 kbps. The EXPLORER 710 BGAN offers Wi-Fi access as well a USB port, two Ethernet ports and an RJ-11 phone port. iOS and Android phones can make phone calls while connected via Wi-Fi using a free app. Options include a corded IP handset and an external pole-mounting system for its remotable IP66-rated antenna unit. Land Vehicle BGAN Terminals: Outfitter Satellite offers several BGAN terminals for land vehicles that support voice and high speed internet on-the-move. These terminals are a favorite of tornado chasers, local TV news vans, police departments, and military users. Vehicular BGAN terminals have a low-profile antenna designed to stand up to cold, hot, or wet environments. The Hughes 9450-c11 is the most popular vehicular BGAN terminal because it offers a good overall combination of features, performance and price. For the highest on-the-move streaming rates, choose the Cobham EXPLORER 727. We offer Inmarsat BGAN service plans with bundled usage appropriate for every application and budget. The Shared Corporate Allowance Plans or SCAP plans allows many Inmarsat BGAN terminals to share a single large data bundle which keeps costs down for users with ten or more Inmarsat BGAN terminals. Our postpaid plans also have options for Public Static IP addresses and IP-sec. We offer satellite-optimized email software, high-usage monitoring, online traffic reports, and an online firewall to block unwanted IP traffic types. On most plans, we can offer PoP-level firewall services to block undesired traffic, PoP-level web compression, and PoP-level web filtering. Automatic email alerts are available on postpaid plans to inform the user when usage exceeds expected thresholds (limitations apply). Also, near realtime call traffic reports and data usage traffic reports are available through a web-based service (limitations apply). 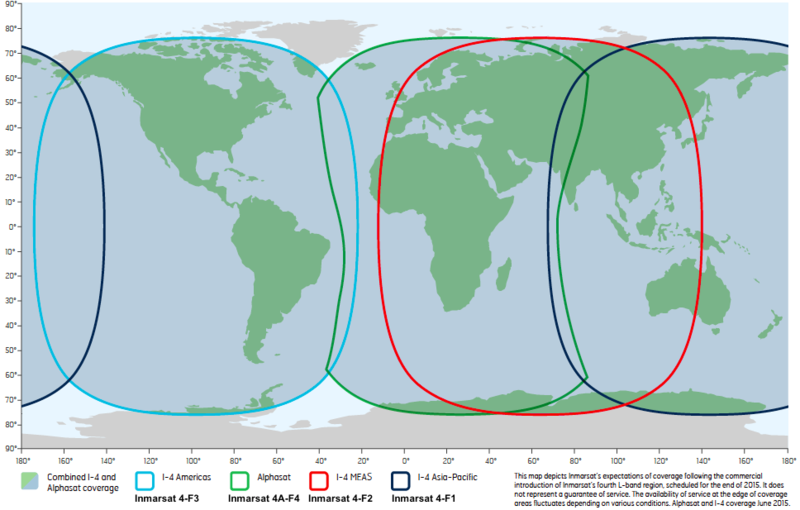 The Inmarsat coverage map shown here assumes that your Inmarsat BGAN terminal's antenna has a direct line of sight with an Inmarsat I-4 satellite. Local obstructions such as mountains can block your line of sight, especially if you are operating in the mountains or you are near the edge of one of the three Inmarsat I-4 satellite foot prints where the satellite would be low on the horizon. It is the responsibility of the user to carefully consider whether the terrain may have obstructions that would block the satellite from view at that location. Outfitter Satellite can give you the elevation angle and azimuthal angle of the best satellite for any particular latitude and longitude if you provide the GPS position of the location where you intend to use the terminal.